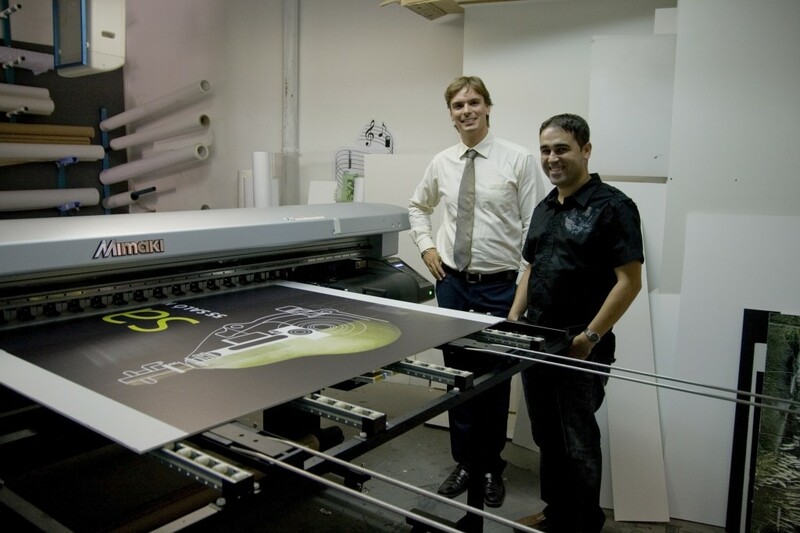 The family run firm, based since its founding in Alcoletge, near Lleida (Spain), has installed a Mimaki UJV 160 wide format inkjet printer to meet their customers’ demands for high quality print on rigid media. Founded by Josep Cano, the company began its activities dedicated to decorative painting and sign making using manual processes. The seven people working in SIGNUMrètols are highly trained and experienced allowing the company to offer solutions for all kind of signs, including POP, vehicle decoration and window dressing. the company specializes in decor for events, from a full football field to a fair or congress. The company evolution from decorating with paint and manual signage to digital production has been smooth and fast: “At first, most of the activity was painting and just one or two percent was sign production. However, things have turned around because now anything and everything can be digitally printed so we don’t paint anymore, “said Oriol Cano, son of the founder and current head of the firm. Around the turn of the millennium there was a change in our activity from painting to digital printing and signage. “We kept to vinyl cutting for quite a time, because at first wide format presses cost too much. Once the prices were more reasonable, we acquired our first water-based plotter and then a pre-owned solvent based one. 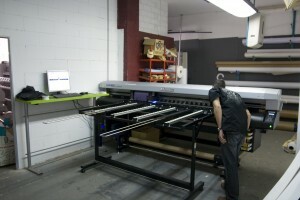 Soon we bought a second solvent based wide format printer. The whole process was carried out in a very short period during the last seven years, “said Oriol Cano. The extensive production equipment includes two printer-cutter plotters, one water-based ink printer, two solvent-based ink large format printers, one eco-solvent large format printer and the recently installed wide-format Mimaki UJV 160 printer with UV inks for flexible and rigid substrates. The company has also finishing equipment, laminators, cutters, and other ancillary equipment, to complete the entire production process. The company’s business extends beyond the area of Lleida, with a significant number of clients in the areas of Barcelona, Madrid and Valencia. The new printer was installed in June 2009 and from the very first day production work was done. “Times of crisis are also times of opportunity, with this wide format printer we can offer unique applications. We print and install, and the only thing we do not do is design, “says Oriol Cano. “Most of our customers are graphic design agencies, advertising agencies, interior designers and institutions that are looking for service and price”. The Mimaki UJV 160 is a hybrid inkjet printing equipment capable of printing both on flexible and rigid materials. Print speed is five square meters per hour at a resolution of 1,200 x 1,200 dpi in high quality mode, which ensures superb quality images. This printer is an improvement on the UJV series and can use heavier rigid materials, supporting up to 12 kg (previous models supported a maximum weight of 2 kg). The Mimaki UJV 160 Printer has a low-power LED UV curing system that generates little heat during use so heat sensitive materials can be printed. The printer uses either two types of ink: flexible UV inks and UV hard inks. The flexible UV ink can stretch up to 200% and allows for UV printing applications such as fleet decoration, using thin PVC that fit both vehicles and any other curved surface. One advantage of the Mimaki UJV 160, which the SIGNUMrètols manager highlights, is head cleaning process. In other printers this process employ a lot of ink, which is a major expense that is not reflected in production. With the Mimaki UJV 160 this cleaning process consumes a much smaller amount of ink, so the ink cartridges last longer. In addition to the standard cartridges, this printer can use high-capacity cartridges containing 600ml.